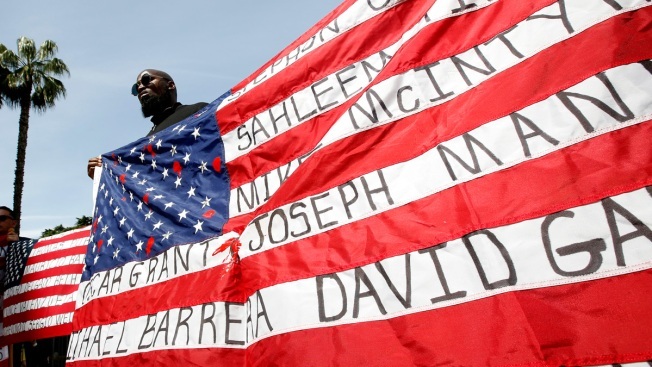 Malaki Seku Amen holds up an American flag with the names of people shot and killed by law enforcement officers, as he joins other in support of a bill that would restrict the use of deadly force by police, Monday, April 8, 2019, in Sacramento, Calif. The bill, AB392 by Democratic Assembly members Shirley Weber, of San Diego, and Kevin McCarty, of Sacramento, would require officers to use de-escalation tactics and allow them to use deadly force only when it is necessary to prevent immediate harm to themselves or others. California lawmakers considered emotional testimony from officers and survivors of police shootings Tuesday as they advanced a first-in-the-nation measure restricting when police can use deadly force. The legislation faces a tough fight in the full Assembly, where it stalled last year. Even supporters on the public safety committee said it goes too far and will need changes as lawmakers try to balance the safety of officers and those they're tasked with protecting in the nation's most populous state. Last year's police shooting of unarmed vandalism suspect Stephon Clark in Sacramento inspired the proposal that would allow officers to kill only if there is no reasonable alternative, such as verbal persuasion or other non-lethal methods of resolution or de-escalation. "It's time to make clear that the sanctity of human life is policing's highest priority," said Democratic Assemblywoman Shirley Weber of San Diego, who wrote the legislation that advocates hope will be a model for other states. But the committee's chairman, Democratic Assemblyman Reggie Jones-Sawyer of Los Angeles, said a tougher standard will do little good without buy-in from law enforcement organizations. They're supporting a radically different plan, which lawmakers also will consider, requiring that every department have policies on when officers should use de-escalation tactics and other alternatives to deadly force. The stricter measure received party-line support Tuesday. The two Republicans on the eight-member public safety committee opposed the proposal that they said could make officers hesitate for a fatal second if they have to consider alternatives to using lethal force. Ciara Hamilton testified about her cousin, Diante Yarber, who was killed by police last year in a busy Southern California parking lot. Yarber, a car theft suspect who was black, was shot after Barstow police said he hit two squad cars and nearly struck an officer. His family says the car was barely moving and that he might have lived had officers provided immediate medical attention. "What does that tell us about policing in California and America? It's that black and brown people are not safe from state-sanctioned violence," Hamilton said. Sacramento County Deputy Sheriff Julie Robertson testified how her partner, Mark Stasyuk, was killed by a suspect last fall during a gunfight that had her second-guessing her own actions even as she fired back. "This bill makes me wonder if sacrificing everything is worth it," Robertson said. A Senate committee is expected to consider the police-backed alternative in two weeks. That measure would enshrine court standards into state law, allowing officers to use deadly force when they have a reasonable fear of being harmed. The standard has made it rare for officers to be charged in a shooting and rarer still for them to be convicted. Law enforcement groups plan to make changes to their measure "to ensure that we are truly putting forward the most comprehensive legislative solution to effectively reduce the use of force in our state," California Police Chiefs Association president Ron Lawrence said in statement. Despite supporters' expectations and law enforcement's fears, Plumas County sheriff's Deputy Ed Obayashi, a use-of-force expert, called the stricter Assembly Bill 392 "an exercise in legal futility." Obayashi predicts judges will interpret the measure's language the same way they do court rulings. Prosecutors would have to prove an officer was criminally negligent, which carries a high legal burden. "There may be some fence-sitting cases, but the officers' conduct would have to be so out of the norm," said Obayashi, who teaches officers statewide about use of force. "If the proponents of 392 believe this is somehow going to shift the needle legally, I'm sorry, it's not." For instance, the two Sacramento officers who shot Clark last year, setting off national protests, would still be unlikely to face charges because they appear to have believed Clark was pointing a gun at them instead of a cellphone, Obayashi said. Weber and her co-author, Democratic Assemblyman Kevin McCarty of Sacramento, said before Tuesday's vote that they expect relatively few police officers to face criminal charges even if the measure becomes law. The standard would apply "only in a few instances, such as when an officer shoots and fires at a fleeing felon in the back," McCarty said. "But when they do cross the line, there needs to be accountability." Weber said officers would have to egregiously violate a policy to face charges but expects the standard would deter shootings. 5-Foot Alligator, Ferret, Marijuana Seized in Calif.
"Hopefully we won't be dealing with the issue of people being unarmed and shot," she said.